With the price of oil scrapping the underbelly of triple digits, lets step back and take a long term view of things. 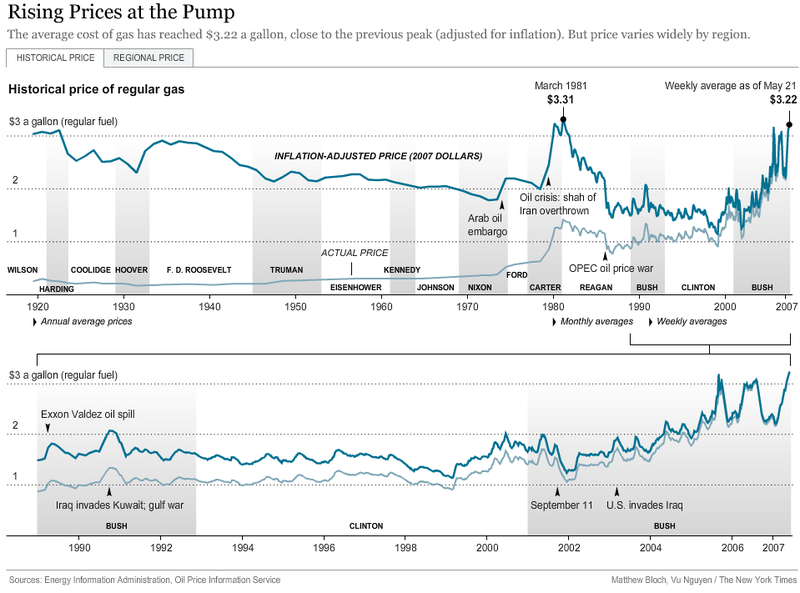 Below is a fascinating graph plotting the historic price of oil, both nominal and inflation adjusted. The data shows both barrel as well as at the pump (per gallon). I had no idea that we are just now getting back up to where prices were in 1920! In fact, if you take out the 1979 oil crisis brought about by the Iranian revolution and the recent wars in the Middle East, the price of oil looks like it wants to go down, not up. Imagine where it would be if OPEC didn’t exist to dictate as a pseudo-monopoly!